Well here are two more variations on a theme. 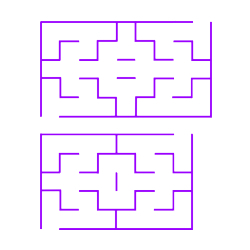 I was aiming for a small symmetrical maze design and once I had one it lead to the other. The bigger one of the two could have a statue in each of the four alcoves where the statues would stare at each other. Although two of the statues wouldn’t but then I thought the two central panels could be artistic glass panels and so they could again. Then I thought what if you made a whole maze out of glass. You could either have the coloured glass bricks so you couldn’t see through the walls but the maze was flooded with light or plain glass so you could see everyone in the maze, could be handy for adults keeping an eye on the kids. Definitely some options there for a maze concept and a variation on the original mirror maze. This entry was posted in Our Maze Concepts, Simple Artistic. Bookmark the permalink.